Each day there are many things that provide us with purpose and pleasure. 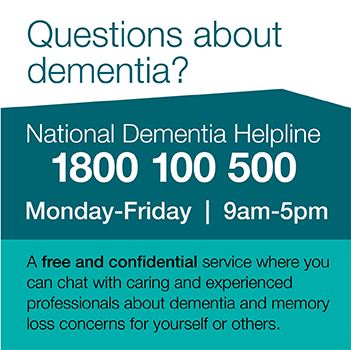 For a person with dementia, the need for a good quality of life is not diminished. Abilities can vary greatly depending on a person’s age or their stage of dementia, but keeping involved and active in the things you enjoy is extremely important. Many people will continue to live successfully on their own and can still engage in meaningful activities by developing and using strategies, routines and support that best suits their individual needs. Rather than giving up on hobbies, interests and activities that are becoming difficult, it may be possible to modify the activity. For a person with dementia, it also helps to talk to other people who may be able to help them work out how to continue doing the things they enjoy. Support from family, carers and friends can be of great assistance to people whose ability to achieve purpose and pleasure has become much more difficult. Below are a range of helpful guidelines that can help in planning appropriate activities. This means knowing the person’s former lifestyle, work history, hobbies, recreational and social interests, travel and significant life events. Make use of skills that have not been forgotten, such as washing up, sweeping or gardening. These are also ways in which a person with dementia can contribute to the household and feel useful. Encourage an area of responsibility no matter how small. It is very important to keep enjoying anything that gives meaning to one's life or provides a sense of pleasure or relaxation. Many people enjoy creative hobbies such as playing a musical instrument, knitting or painting. Others enjoy social contact, so it is important to keep this up as much as possible. A person with dementia may enjoy an outing even if they may not remember where they have been. What is important is that the moment is enjoyed. Give the time and space necessary to allow the person to do as much as possible. Focus on one thing at a time. Break down activities into simple, manageable steps. Communicate one instruction at a time. People with dementia often have difficulty with visual perception and coordination. Ensure that surfaces are uncluttered with few distractions and noise. Good lighting, without glare, individual seat preferences and correct work heights are all important. If necessary, using plastic containers might help to avoid breakages. Abilities can fluctuate from day to day. Activities can be adapted and tried another time if not successful or enjoyable. To ensure maximum success when carrying out activities it is best to consider the times of day when the person is at their best. For instance, sometimes walking is best done in the morning or the early afternoon. However for some people who are particularly restless later in the day, or who have had a particularly long or meaningless day, a late afternoon walk may be better. Be selective with outings. Some people with dementia find that being among large groups of people can be overwhelming. If this is the case, avoid crowds, constant movement and noise. For many people, music or contact with babies, children or animals provides positive feelings. Excellent memories of past events are often kept and looking through old photos, memorabilia and books enables the recall of earlier times. The opportunity to relive treasured moments can be deeply satisfying. If reading skills have deteriorated make individual audiotapes. Locate picture books and magazines in the person’s areas of interest. Hire an exercise bike or a walking machine for rainy days. Be spectators or participants at dance classes or walk the dog together. Walkers enjoy the wider world while getting much needed exercises. It can be helpful to write out an activities care plan if different people are caring for the person. This will ensure that activities are consistent and are suited to the individual needs of a person with dementia. Activities play a significant part in the dealing with changed behaviours. Knowing what helps to calm or divert a person when they are restless or distressed is very important. This can be particularly helpful for respite workers. It is possible to continue living a good quality life with dementia, despite any challenges that may be faced along the way. Mistakes can happen, so it is very important that you don’t let the person with dementia ever feel like a failure. Encourage them to keep trying, and to continue engaging in activities that provide a sense of purpose, pleasure and relaxation. It is also important to encourage activities which provide mental stimulation, and promote better health and wellbeing.